Organizational Structure: Do You Belong? This article examines three different organizational structure mechanics used by firms to implement projects: functional organization, dedicated project teams, and matrix structure. Once management approves a project then the question becomes, how will the project be implemented. This article examines three different organizational structure mechanics used by firms to implement projects: functional organization, dedicated project teams, and matrix structure. Although not exhaustive, these organizational structures and their variant forms represent the major approaches for organizing projects. The advantages and disadvantages of each of these organizational structures are discussed as well as some of the critical factors that might lead a firm to choose one form over others. Whether a firm chooses to complete projects within the traditional functional organization or through some form of matrix arrangement is only part of the story. Anyone who has worked for more than one organization realizes that there are often considerable differences in how projects are managed within certain firms with similar organizational structures. Working in a matrix system at Microsoft is different from working in a matrix environment at Hewlett-Packard. Many researchers attribute these differences to the organizational culture at Microsoft and Hewlett- Packard. A simple explanation of organizational culture is that it reflects the “personality” of an organization. Just as each individual has a unique personality, so each organization has a unique culture. In a future article, we examine in more detail what organizational culture is and the impact that the culture of the parent organization has on organizing and managing projects. Both the project management structure and the culture of the organization constitute major elements of the environment in which projects are implemented. It is important for project managers and participants to know the “lay of the land” so that they can avoid obstacles and take advantage of pathways to complete their projects. A project management system provides a framework for launching and implementing project activities within a parent organization. A good system appropriately balances the needs of both the parent organization and the project by defining the interface between the project and parent organization in terms of authority, allocation of resources, and eventual integration of project outcomes into mainstream operations. Many business organizations have struggled with creating a organizational structure for organizing projects while managing ongoing operations. One of the major reasons for this struggle is that projects contradict fundamental design principles associated with traditional organizations. Projects are unique, one-time efforts with a distinct beginning and end. Most organizations are designed to efficiently manage ongoing activities. Efficiency is achieved primarily by breaking down complex tasks into simplified, repetitive processes, as symbolized by assembly-line production methods. Projects are not routine and therefore can be like ducks out of water in these work environments. With this in mind, we will start the discussion of organizational structures. One approach to organizing projects is to simply manage them within the existing functional hierarchy of the organization. 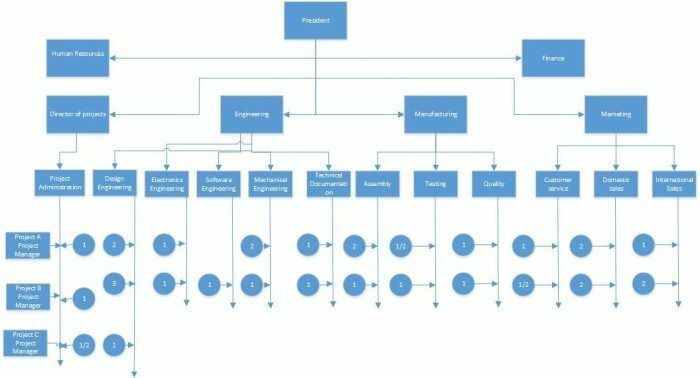 Once management decides to implement a project, the different segments of the project are delegated to the respective functional units with each unit responsible for completing its segment of the project (see figure below). Coordination is maintained through normal management channels. For example, a tool manufacturing firm decides to differentiate its product line by offering a series of tools specially designed for left-handed individuals. Top management decides to implement the project, and different segments of the project are distributed to appropriate areas. The industrial design department is responsible for modifying specifications to conform to the needs of left-handed users. The production department is responsible for devising the means for producing new tools according to these new design specifications. The marketing department is responsible for gauging demand and price as well as identifying distribution outlets. The overall project will be managed within the normal hierarchy, with the project being part of the working agenda of top management. The functional organization is also commonly used when, given the nature of the project, one functional area plays a dominant role in completing the project or has a dominant interest in the success of the project. Under these circumstances, a high-ranking manager in that area is given the responsibility of coordinating the project. For example, the transfer of equipment and personnel to a new office would be managed by a top-ranking manager in the firm’s facilities department. Likewise, a project involving the upgrading of the management information system would be managed by the information systems department. In both cases, most of the project work would be done within the specified department and coordination with other departments would occur through normal channels. No Change. Projects are completed within the basic functional structure of the parent organization. There is no radical alteration in the design and operation of the parent organization. Flexibility. There is maximum flexibility in the use of staff. Appropriate specialists in different functional units can temporarily be assigned to work on the project and then return to their normal work. With a broad base of technical personnel available within each functional department, people can be switched among different projects with relative ease. In-Depth Expertise. If the scope of the project is narrow and the proper functional unit is assigned primary responsibility, then in-depth expertise can be brought to bear on the most crucial aspects of the project. Easy Post-Project Transition. Normal career paths within a functional division are maintained. While specialists can make significant contributions to projects, their functional field is their professional home and the focus of their professional growth and advancement. Lack of Focus. Each functional unit has its own core routine work to do; sometimes project responsibilities get pushed aside to meet primary obligations. This difficulty is compounded when the project has different priorities for different units. For example, the marketing department may consider the project urgent while the operations people considered it only of secondary importance. Imagine the tension if the marketing people have to wait for the operations people to complete their segment of the project before they proceed. Poor Integration. There may be poor integration across functional units. Functional specialists tend to be concerned only with their segment of the project and not with what is best for the total project. Slow. It generally takes longer to complete projects through this functional arrangement. This is in part attributable to slow response time—project information and decisions have to be circulated through normal management channels. Furthermore, the lack of horizontal, direct communication among functional groups contributes to rework as specialists realize the implications of others’ actions after the fact. Lack of Ownership. The motivation of people assigned to the project can be weak. The project may be seen as an additional burden that is not directly linked to their professional development or advancement. Furthermore, because they are working on only a segment of the project, professionals do not identify with the project. Lack of ownership discourages strong commitment to project-related activities. At the other end of the organizational structure spectrum is the creation of dedicated project teams. These teams operate as separate units from the rest of the parent organization. Usually a full-time project manager is designated to pull together a core group of specialists who work full time on the project. The project manager recruits necessary personnel from both within and outside the parent company. The subsequent team is physically separated from the parent organization and given marching orders to complete the project (see the picture below). The interface between the parent organization and the project teams will vary. In some cases, the parent organization maintains a tight rein through financial controls. In other cases, firms grant the project manager maximum freedom to get the project done as he sees fit. Lockheed Martin has used this organizational structure to develop next-generation jet airplanes. In the case of firms where projects are the dominant form of business, such as a construction firm or a consulting firm, the entire organization is designed to support project teams. Instead of one or two special projects, the organization consists of sets of quasi-independent teams working on specific projects. The main responsibility of traditional functional departments is to assist and support these project teams. For example, the marketing department is directed at generating new business that will lead to more projects, while the human resource department is responsible for managing a variety of personnel issues as well as recruiting and training new employees. This type of organizational structure is referred to in the literature as a Proiectized Organization and is graphically portrayed in the figure below . It is important to note that not all projects are dedicated project teams; personnel can work part-time on several projects. Simple. Other than taking away resources in the form of specialists assigned to the project, the functional organization remains intact with the project team operating independently. Fast. Projects tend to get done more quickly when participants devote their full attention to the project and are not distracted by other obligations and duties. Furthermore, response time tends to be quicker under this arrangement because most decisions are made within the team and are not deferred up the hierarchy. Cohesive. A high level of motivation and cohesiveness often emerges within the project team. Participants share a common goal and personal responsibility toward the project and the team. Cross-Functional Integration. Specialists from different areas work closely together and, with proper guidance, become committed to optimizing the project, not their respective areas of expertise. Expensive. Not only have you created a new management position (project manager), but resources are also assigned on a full-time basis. This can result in duplication of efforts across projects and a loss of economies of scale. Internal Strife. Sometimes dedicated project teams take on an entity of their own and a disease known as projectitis develops. A strong we—the team develops a strong identity that will cause a rift between the project team and the parent organization. This divisiveness can undermine not only the integration of the eventual outcomes of the project into mainstream operations but also the assimilation of project team members back into their functional units once the project is completed. Limited Technological Expertise. Creating self-contained teams inhibits maximum technological expertise being brought to bear on problems. Technical expertise is limited somewhat to the talents and experience of the specialists assigned to the project. While nothing prevents specialists from consulting with others in the functional division, the we—they syndrome and the fact that such help is not formally sanctioned by the organization discourage this from happening. Difficult Post-Project Transition. Assigning full-time personnel to a project creates the dilemma of what to do with personnel after the project is completed. If other project work is not available, then the transition back to their original functional departments may be difficult because of their prolonged absence and the need to catch up with recent developments in their functional area. One of the biggest management innovations to emerge in the past 30 years has been the matrix organization. 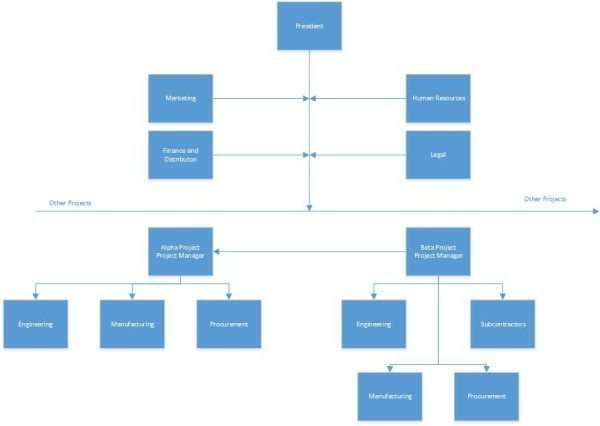 Matrix management is a hybrid organizational structure in which a horizontal project management structure is “overlaid” on the normal functional hierarchy. In a matrix system, there are usually two chains of command, one along functional lines and the other along project lines. Instead of delegating segments of a project to different units or creating an autonomous team, project participants report simultaneously to both functional and project managers. Companies apply this matrix arrangement in a variety of different ways. Some organizations set up temporary matrix systems to deal with specific projects, while “matrix” may be a permanent fixture in other organizations. Let us first look at its general application of this organizational structure and then proceed to a more detailed discussion of finer points. Consider the figure below. There are three projects currently under way: A, B, and C.
All three project managers (PM A, B, C) report to a director of project management, who supervises all projects. Each project has an administrative assistant, although the one for project C is only part time. Project A involves the design and expansion of an existing production line to accommodate new metal alloys. To accomplish this objective, project A has assigned to it 3.5 people from manufacturing and 6 people from engineering. These individuals are assigned to the project on a part-time or full-time basis, depending on the project’s needs during various phases of the project. Project B involves the development of a new product that requires the heavy representation of engineering, manufacturing, and marketing. Project C involves forecasting changing needs of an existing customer base. While these three projects, as well as others, are being completed, the functional divisions continue performing their basic, core activities. The matrix organizational structure is designed to optimally utilize resources by having individuals work on multiple projects as well as being capable of performing normal functional duties. At the same time, the matrix approach attempts to achieve greater integration by creating and legitimizing the authority of a project manager. 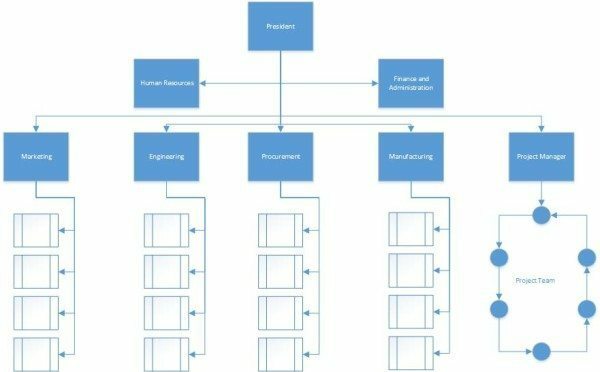 In theory, the matrix organizational structure provides a dual focus between functional/ technical expertise and project requirements that is missing in either the project team or functional approach to project management. This focus can most easily be seen in the relative input of functional managers and project managers over key project decisions. Weak matrix—This form is very similar to a functional approach with the exception that there is a formally designated project manager responsible for coordinating project activities. Functional managers are responsible for managing their segment of the project. The project manager basically acts as a staff assistant who draws the schedules and checklists, collects information on status of work, and facilitates project completion. The project manager has indirect authority to expedite and monitor the project. Functional managers call most of the shots and decide who does what and when the work is completed. Balanced matrix—This is the classic matrix in which the project manager is responsible for defining what needs to be accomplished while the functional managers are concerned with how it will be accomplished. More specifically, the project manager establishes the overall plan for completing the project, integrates the contribution of the different disciplines, sets schedules, and monitors progress. The functional managers are responsible for assigning personnel and executing their segment of the project according to the standards and schedules set by the project manager. The merger of “what and how” requires both parties to work closely together and jointly approve technical and operational decisions. Strong matrix—This form attempts to create the “feel” of a project team within a matrix environment. The project manager controls most aspects of the project, including scope trade-offs and assignment of functional personnel. The project manager controls when and what specialists do and has final say on major project decisions. The functional manager has title over her people and is consulted on a need basis. In some situations a functional manager’s department may serve as a “subcontractor” for the project, in which case they have more control over specialized work. Efficient. Resources can be shared across multiple projects as well as within functional divisions. Individuals can divide their energy across multiple projects on an as-needed basis. This reduces duplication required in a projectized structure. Strong Project Focus. A stronger project focus is provided by having a formally designated project manager who is responsible for coordinating and integrating contributions of different units. This helps sustain a holistic approach to problem solving that is often missing in the functional organization. Easier Post-Project Transition. Because the project organization is overlaid on the functional divisions, specialists maintain ties with their functional group, so they have a homeport to return to once the project is completed. Flexible. Matrix arrangements provide for flexible utilization of resources and expertise within the firm. In some cases functional units may provide individuals who are managed by the project manager. In other cases the contributions are monitored by the functional manager. Dysfunctional Conflict. The matrix organizational structure is predicated on tension between functional managers and project managers who bring critical expertise and perspectives to the project. 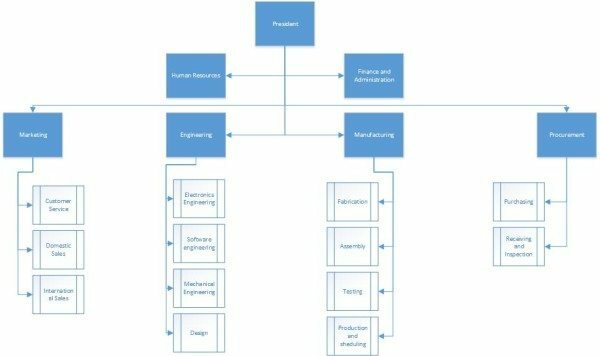 Such tension is viewed as a necessary mechanism for achieving an appropriate balance between complex technical issues and unique project requirements. While the intent is noble, the effect is sometimes analogous to opening Pandora’s box. Legitimate conflict can spill over to a more personal level, resulting from conflicting agendas and accountabilities. Worthy discussions can degenerate into heated arguments that engender animosity among the managers involved. Infighting. Any situation in which equipment, resources, and people are being shared across projects and functional activities lends itself to conflict and competition for scarce resources. Infighting can occur among project managers, who are primarily interested in what is best for their project. Stressful. Matrix management violates the management principle of unity of command. Project participants have at least two bosses—their functional head and one or more project managers. Working in a matrix environment can be extremely stressful. Imagine what it would be like to work in an environment in which you are being told to do three conflicting things by three different managers. Slow. In theory, the presence of a project manager to coordinate the project should accelerate the completion of the project. In practice, decision making can get bogged down as agreements have to be forged across multiple functional groups. This is especially true for the balanced matrix organizational structure. When the three variant forms of the matrix approach are considered, we can see that advantages and disadvantages are not necessarily true for all three forms of matrix. The Strong matrix is likely to enhance project integration, diminish internal power struggles, and ultimately improve control of project activities and costs. On the downside, technical quality may suffer because functional areas have less control over their contributions. Finally, projectitis may emerge as the members develop a strong team identity. The Weak matrix is likely to improve technical quality as well as provide a better system for managing conflict across projects because the functional manager assigns personnel to different projects. The problem is that functional control is often maintained at the expense of poor project integration. The Balanced matrix can achieve better balance between technical and project requirements, but it is a very delicate system to manage and is more likely to succumb to many of the problems associated with the matrix organizational structure. 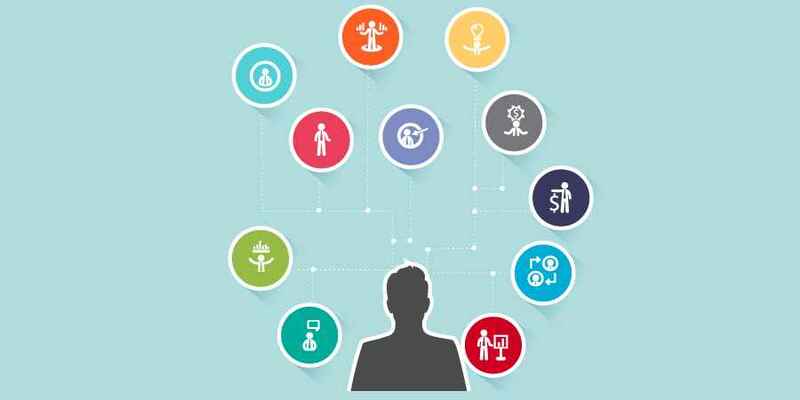 What Is the Right Organizational Structure? There is growing empirical evidence that project success is directly linked to the amount of autonomy and authority project managers have over their projects. However, most of this research is based on what is best for managing specific projects. It is important to remember what was stated in the beginning of the article that the best system balances the needs of the project with those of the parent organization. So what organizational structure should a company use? This is a complicated question with no precise answers. A number of issues need to be considered at both the organization and project level. At the organization level, the first question that needs to be asked is how important is project management to the success of the firm? What percentage of core work involves projects? If over 75 percent of work involves projects, then an organization should consider a fully projectized organization. If an organization has both standard products and projects, then a matrix arrangement would appear to be appropriate. If an organization has very few projects, then a less formal arrangement is probably all that is required. Dedicated teams could be created on an as-needed basis and the organization could outsource project work. A second key question is resource availability. Remember, matrix organizational structure evolved out of the necessity to share resources across multiple projects and functional domains while at the same time creating legitimate project leadership. For organizations that cannot afford to tie up critical personnel on individual projects, a matrix system would appear to be appropriate. An alternative would be to create a dedicated team but outsource project work when resources are not available internally. Within the context of the first two questions, an organization needs to assess current practices and what changes are needed to more effectively manage projects. A strong project matrix is not installed overnight. The shift toward a greater emphasis on projects has a host of political implications that need to be worked through, requiring time and strong leadership. For example, we have observed many companies that make the transition from a functional organization to a matrix organization begin with a weak functional matrix. This is due in part to resistance by functional and department managers toward transferring authority to project managers. With time, these matrix structures eventually evolve into a project matrix. Many organizations have created Project Management Offices to support project management efforts. Novelty and need for innovation. Need for integration (number of departments involved). Environmental complexity (number of external interfaces). The higher the levels of these seven factors, the more autonomy and authority the project manager (Skills a project manager should nurture) and project team need to be successful. This translates into using either a dedicated project team or a project matrix structure. For example, these organizational structures should be used for large projects that are strategically critical and are new to the company, thus requiring much innovation. These organizational structures would also be appropriate for complex, multidisciplinary projects that require input from many departments, as well as for projects that require constant contact with customers to assess their expectations. Dedicated project teams should also be used for urgent projects in which the nature of the work requires people working steadily from beginning to end. Many firms that are heavily involved in project management have created a flexible organizational structure that organizes projects according to project requirements. For example, Chaparral Steel, a mini-mill that produces steel bars and beams from scrap metal, classifies projects into three categories: advanced development, platform, and incremental. Advanced development projects are high-risk endeavors involving the creation of a breakthrough product or process. Platform projects are medium-risk projects involving system upgrades that yield new products and processes. Incremental projects are low-risk, short-term projects that involve minor adjustments in existing products and processes. At any point in time, Chaparral might have 40—50 projects underway, of which only one or two are advanced, three to five are platform projects, and the remainder are small, incremental projects. The incremental projects are almost all done within a weak matrix with the project manager coordinating the work of functional subgroups. A strong matrix is used to complete the platform projects, while dedicated project teams are typically created to complete the advanced development projects. More and more companies are using this “mix and match” approach develop their organizational structure and successfully deliver projects.